Islands of Cats: Newsletter #7: Ebook Out Now: "Islands of Cats - about Stray Cat Carers in Malta"
Newsletter #7: Ebook Out Now: "Islands of Cats - about Stray Cat Carers in Malta"
'Islands of Cats' out now ! We are proud to announce the release of 'Islands of Cats' - in English, German, or Maltese. 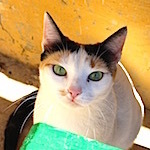 'Islands of Cats' portrays a representative 22 of 1,000+ Stray Cat Carers and shelters in Malta and Gozo, outlines places of interests in the wider area of the cat colonies, contains interviews, cat facts and much more. An entertaining, informative and educational publication with the purpose to create more awareness of the important work of Stray Cat Carers and their feline protégés in the Maltese Islands. The ebook comes as fixed-layout PDF, with 222 high-resolution colour photographs on 121 pages, readable on any device with a pdf-reader: desktop, notebook, tablet, and smartphone. From each book sold, we will return 1 Euro to the community of Stray Cat Carers. We are currently evaluating cat food vouchers and/or vouchers for spaying and neutering. Please share the news with your friends and family, and like us on Facebook, follow us on Twitter, and visit our blog. Thank you so much for your time and consideration.